In the weeks and months since the Pacific Union and the Columbia Union voted to proceed with ordination without regard to gender, there have been services of ordination honoring women who served significantly over the years without the recognition of ordination, as well as services providing new credentials to those who were previously commissioned, but not ordained. Josephine Benton's lifelong ministry will be celebrated during the worship service at Sligo Church on February 16, where leaders of the Columbia Union Conference will conduct a special ordination ceremony. Josephine was the first woman to be ordained as a local elder in the Adventist denomination in the 20th century. She served as an associate pastor at Sligo Church and also as senior pastor of the Rockville SDA Church in Maryland. During retirement, she has served for 19 years as chaplain for the Williamsport Retirement Village in Williamsport, Maryland. 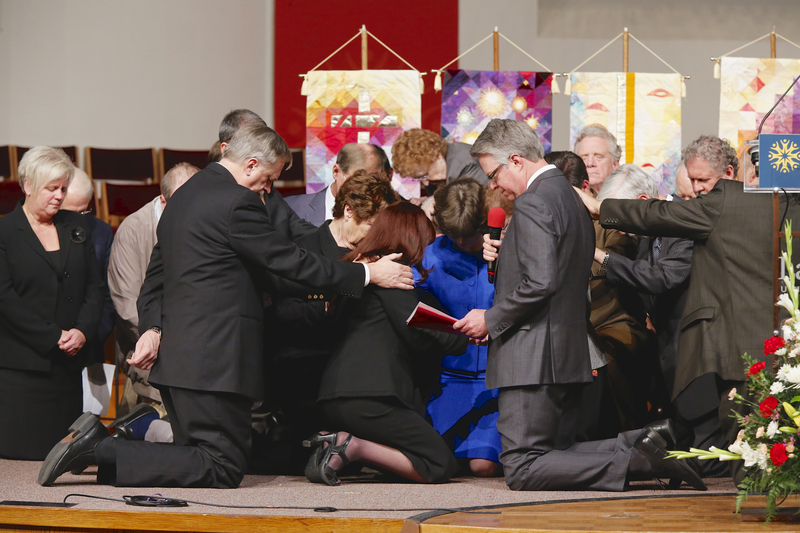 At the La Sierra University University Church on February 2, there was a service to ordain Ginger Hanks Harwood and affirm the ministry of Kendra Haloviak Valentine, Yami Bazan, and Larry Geraty. “We gather not to do something but to acknowledge something already done by the Holy Spirit,” John Webster, dean of the HMS Richard Divinity School, said as he introduced the candidates, all of whom are faculty or administrators at La Sierra University. Currently, Ginger Hanks Harwood is associate professor of religious and theological studies in the HMS Richards Divinity School. During her career she has also served as a chaplain, first at Porter Seventh-day Adventist Hospital and more recently part-time at the Linda Valley Villa Retirement Center. While in attendance at the SDA Theological Seminary at Andrews University, she was a charter member of the All Nations Church, where she was ordained as an elder. In 1990, she left chaplaincy for university teaching, which has since been her primary arena of ministry. She has written significantly on the spirituality of early Adventist women. Bradford Newton, the Executive Secretary of the Pacific Union, gave the ordination charge from II Timothy 4:1-5 for Harwood. At the same service there was affirmation of the ministry of three individuals. Yami Bazan was originally ordained-commissioned in 2006. She has been involved in education and youth ministries for 18 years. She began her career as an educator, continued as a minister, served as associate youth director of her conference for eight years and for the past six years has served as vice president for student life at La Sierra University. LSU President Emeritus Larry Geraty turned in his ministerial credentials in the 1990s, in protest of the church’s refusal to ordain women. He asked for the same commissioned credential given to women. He also supported the ordination of his sister-in-law Norma Osborn at Sligo in 1995. Although he retired as university president in 2007, Geraty is the executive director of the LSU Foundation, chair of several non-profits and remains active in several local and civic organizations. He is a professor of archaeology and Old Testament Studies at LSU and is currently a visiting professor of archaeology at Newbold College. Kendra Haloviak Valentine, chair of the Department of Biblical Studies at LSU, was ordained to the gospel ministry on September 25, 1995 at the Sligo Seventh-day Adventist Church, in a ceremony that came just weeks after the General Conference vote at Utrecht refusing to allow the North American Division to proceed with ordination of women. Her local church ordination was thus not recognized by some other church entities. Her pastoral ministry began at Sligo in 1991. She joined the religion department of Columbia Union College in 1993. Her doctorate in Biblical studies is from the Graduate Theological Union in Berkeley, California. In 2001, she joined the faculty of LSU where she is an associate professor of New Testament Studies. In his homily for the service, Fritz Guy focused on the nine remarkable women of Romans 16. These were women who were an active part of the church community. “They were there and they mattered,” he said pointing out that they were not all alike. Some were married, others single, some were Gentiles, some Jews. They had various kinds of vocations. But they were equal in Christ, he noted as we are called to be in our Fundamental Belief number 14. “And they were appreciated,” he said. Guy is research professor of philosophical theology at the HMS Richards Divinity School, La Sierra University. Banners depicting the seven churches of Revelation were on the platform at the service, the same banners that had been used at the 1995 ordination service at Sligo. An original responsive reading “Beginnings to Beginnings: Responding Faithfully to the Spirit of God,” was led by its author Charles Teel with his wife Marta. Teel wrote the piece for the 1995 ordination of Halcyon Westphal Wilson and Madelynn Jones-Haldeman at the La Sierra University Church. Each of the eight paragraphs in the reading ends with the audience responding “And it was good.” That phrase was oft repeated at the reception that followed the recent service, too.